The folks over at Piccadilly Publishing are pretty dang smart. When they grabbed John Benteen's (aka Ben Haas') amazing FARGO series, they were clever enough to also grab his Westerns. This includes his SUNDANCE series, a great haul if for no other reason than the series itself is much longer-lived than FARGO. Thankfully, there are plenty of reasons why republishing SUNDANCE is great. The eponymous character, Jim Sundance, is a half-white, half-Cheyenne adventurer. When we meet him he's in his 30's, already a man who has roamed and fought across the length and breadth of the U.S., moving between the worlds of the white man and the Indian. The timeframe for the book is sometime a few months after the Battle of Washita River, putting the book most likely in the late spring or early summer of 1869. Sundance is your typical Benteen hero: tall, broad-shouldered, with a slim waist and a lean, powerful build. He has the complexion and features of a Cheyenne Indian, but his hair is a bright golden blond, a gift from his English father. Sundance received his name - his Indian name - after participating in the Sun Dance ritual, The description given of Sundance's experience is one of the more extreme, although it's got nothing on the movie A Man Called Horse, which has a really graphic Sun Dance ritual scene. I've actually attended a Sioux Sun Dance, and even back in the 90's, there was some ritual body piercing going on, although very rare. On top of his unusual heritage, Sundance carries an unusual arsenal. In typical Benteen fashion, his main character is very deliberately armed with an assortment of weapons from both cultures. Sundance carries a Navy Colt and a Henry repeating rifle, as well as a Bowie knife with a fourteen-inch blade and a hand guard for knife-fighting. In addition, he carries a steel-bladed tomahawk, as well as a Cheyenne dog soldier's war shield and a bow, along with a quiver of thirty flint-headed arrows. Benteen goes to great length to note that Sundance prefers flint tips to steel, claiming that they deliver a more grievous wound, and that with the bow Sundance could kill a man at four hundred yards, or put an arrow through a buffalo. 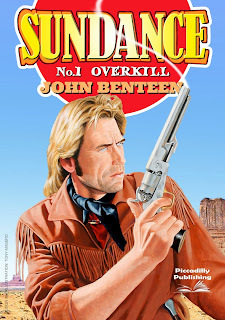 Over the course of the novel Sundance puts every weapon in his arsenal to use, another Benteen trait, and it is interesting to see how Sundance typically uses the white man's weapons for "every day carry", but when he really means business, he tends to favor his more traditional arsenal. It is a cool dynamic, and having read Sundance #2, one that is probably going to carry through to every book in the series. As to the plot? Sundance is hired by a railroad baron to find his young, beautiful daughter, who willfully departed for the West Coast some time ago in a well-guarded wagon train. The train was attacked by Indians and the daughter was captured. Being able to move between the two cultures, Sundance is known to be the man you want when it comes to dealing with the Indians, especially the Cheyenne. But, his services don't come cheap. In an interesting twist, and opposed to Neal Fargo, Sundance funnels his fees back to a lawyer in Washington D.C., where the lawyer lobbies for Indian rights in the hope that they can be saved - as much as possible, at least - from the machinations of the white man. Sundance is an educated man, and he's fully aware of how bleak the future of the Indian is in the U.S., so he does what he can to mitigate damage. I think the idea that he's not just spending his money on liquor and whores is an interesting premise, and makes him a more sympathetic character. Without giving away any spoilers, I'll note that this dedication to his cause results in more than a little turmoil over the course of the novel. Overall, this is an excellent western adventure tale. Sundance is a fascinating character, a mix of some standard Western themes with Benteen's own unique style laid over. The action is fast and violent, the level of detail extraordinary. There's a buffalo hunting scene about halfway through the book that is very impressive, and just as thrilling as any battle sequence. Even if you're not normally a fan of Western stories, I highly recommend the SUNDANCE series. The $1.99 it'll set you back to buy the first book is well worth the experience, and it was certainly enough to get me to buy #2 the moment it was live (and I read it practically in one sitting).